We had a wonderful turnout for our guest speaker, Patricia Kilburg. Based in Greenville, SC, Patricia is known for her colorful and exciting current works painted in encaustic (pigmented wax) and mixed media. She is also a fabric artist and an accomplished prize winning quilter. Patricia encouraged us to appreciate the Artist in us. Never stop being inspired (by a mentor, an art show(s), a composition class, etc.) and lastly, seek objective critique/feedback on your art works. GMQG has a NEW logo. Thank you to all who participated with your logo submissions. We had a fantastic selection to vote on. From our votes, the winning logo design was by Cheryl Brickey. Cheryl's design visually captures the essence of our organization....Creative, Vibrant and Modern. I know we are all excited about it. Thank you, Cheryl. Our new look will roll out soon......we will let you know! GMQG had a book giveaway, in celebration of our own, Cindy Lammon, who wrote the Foreword in Casey York's newest book called The Applique Book. The lucky recipient of the drawing was Nicole McClelland. Enjoy! Another successful month of contributors to the Quilt Block of the Month challenge. Thank you. We appreciate your dedication to making a difference. 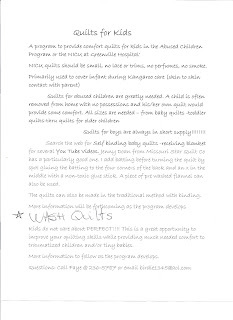 Faye Jones provided information on two children's organizations GMQG will be donating our Philanthropy Quilts too this year (to learn more click on the information photo below to enlarge). Take the challenge to participate. Our quilt blocks of the month are January (Woven), February (Dancing Daisies Block) and March will be Log Cabin. As noted in the photo, our colors are bright solids or patterns with the unifying color being white. The completed block should measure 12.5 in. x 12.5 in. 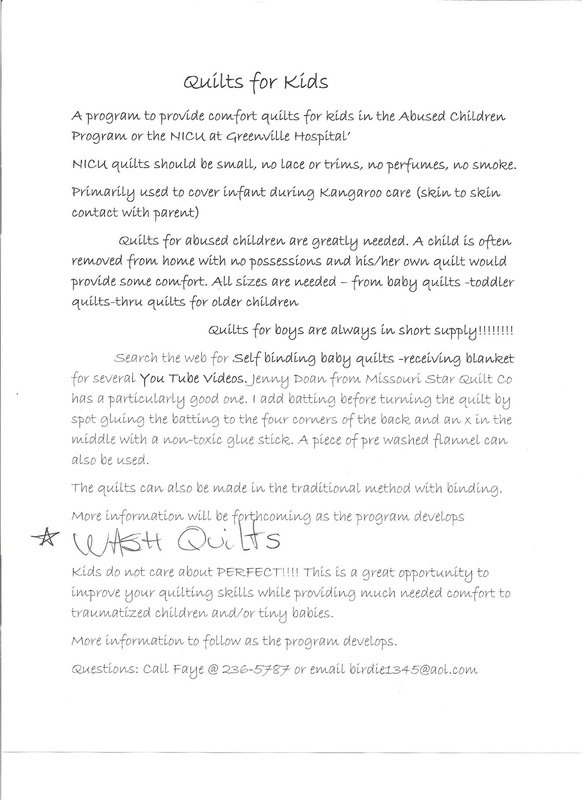 Reminder: for those making quilts, due to children allergies, please wash quilt prior to donating. FYI, Bernina Sewing Center is a donation center for Quilt pillow covers, Lap Quilts and Kennel Quilts. For more information contact the store at 864.235.5031. ﻿Annual membership dues are $35. If you are interested in joining for 2016, please see Paige Alexander. As of March 2016, we have 33 members. For those who are members, Paige Alexander has your official MQG pin. Check-in with her in April. Faye Jones "Silk Batik Scarf Workshop" time/dates are at 10:00 a.m. on April 19th, 23rd and 30th. The cost is $15. If you are interested in the workshop, please email Birdie1345@aol.com by April 7th. Bernina Sewing Center – March 18th GMQG is invited to Farm Girl Friday 6-9 pm. Contact the store at 864.235.5031 for cost (which will include the materials for the session) or visit Leslie White’s upcoming new website for additional details. Also, celebrating National Quilting Day - Saturday, March 19th. Bernina Sewing Center – Celebrates their 1st year anniversary. Visit the website for additional details. Workshop – Quilting 101 by Cindy Lammon. A detail supply list will be provided in April. In preparation, a few machine items are recommended but not required: a Walking Foot and Darning Foot. GMQG re-design logo contest submissions are due. Your submissions can be hand and/or computer drawn. We welcome all to participate. Monica Stegall has volunteered to transform our winning design into a digital graphic design to be used for the website and more. Your idea may just be the new brand look of GMQG! Bring your Block(s) of the Month for January Woven and/or February Dancing Daisies. Plus, don't forget to bring your in-progress and finished quilts for Show & Share. And, if you are still interested in joining GMQG it's not to late. Annual dues are $35. For more details, see Paige Alexander.